- MDOT, in a collaborative effort with other state agencies and the Saginaw Chippewa Indian Tribe of Michigan, is helping to create digital models of the Sanilac Petroglyphs. 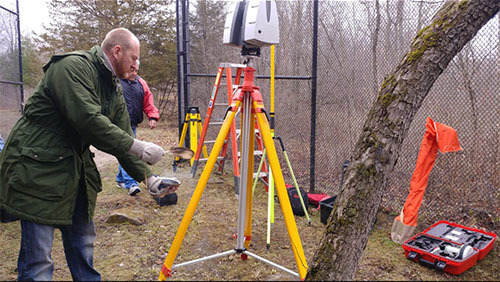 - The MDOT Survey Support Unit used terrestrial LiDAR along with detailed close-up photographs to build digital models of the rock carvings. - The digital models will help with preservation efforts and provide opportunities to study the carvings at a distance. December 5, 2018 -- Using some futuristic technology, the Michigan Department of Transportation (MDOT) has helped document cultural heritage from the distant past. 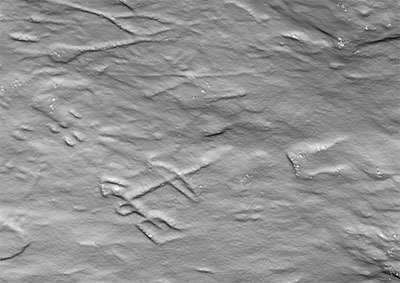 In collaboration with other state agencies and the Saginaw Chippewa Indian Tribe of Michigan, MDOT used laser measuring techniques to create digital models of the Sanilac Petroglyphs, the largest known group of ancient rock carvings in the state. The digital models of more than 100 rock carvings will create opportunities for study and historic preservation. Shannon Martin and William Johnson of the Saginaw Chippewa Tribe's Ziibiwing Center of Anishinabe Culture and Lifeways said the digital preservation of the rock has been a goal of the Tribal Historic Preservation Office since 2006. 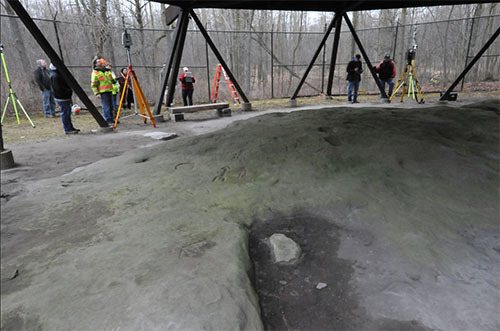 In 2014, a focus group of Great Lakes Anishinabe spiritual leaders and elders convened at the Sanilac Petroglyphs site where they offered their support for LiDAR mapping. "The Saginaw Chippewa Indian Tribe of Michigan is grateful for the opportunity to partner with multiple state agencies on the enhancement and long-term preservation strategy for the Sanilac Petroglyphs," Martin said. Stacy Tchorzynski, an archaeologist at the State Historic Preservation Office (SHPO) who managed the Sanilac Petroglyphs project, said this "community-based project is important because it demonstrates the power of respectful tribal-state partnerships." Stone tools and pottery found on the petroglyph site on the Cass River floodplain show native groups have occupied the area periodically throughout the last 8,000 years. The petroglyphs were likely carved within the last 1,400 years, with some possibly created in more recent centuries. The petroglyphs are carved in relatively soft sandstone. After centuries of natural weathering and decades of recent human activity, some carvings have faded or disappeared. Archaeologists have been studying these petroglyphs since the 1920s and made various attempts to record and preserve them. This year, tribal and state partners renewed preservation efforts using the latest methods. In April, MDOT specialists used terrestrial Light Detection and Ranging (LiDAR) along with detailed close-up photographs to build digital models that will document the site and can be used to track changes in the petroglyphs over time. MDOT's partners in the project included the SHPO (Michigan State Housing Development Authority), the Ziibiwing Center of Anishinabe Culture and Lifeways (Saginaw Chippewa Indian Tribe of Michigan), the Saginaw Chippewa Indian Tribe's Historic Preservation Office, and the Department of Natural Resources' (DNR) Michigan History Center and Parks and Recreation Division. LiDAR instruments collect 3-D information by reflecting laser light off objects. Instruments can be mounted on a static tripod or on a vehicle such as a truck, manned or unmanned aircraft, or boat. MDOT typically uses LiDAR to map existing roads and bridges prior to construction. The 3-D maps and models of the existing conditions serve as a base for design. MDOT can also use the technology after construction to record as-built information or to collect and manage information about assets like signs, guardrails, and power and light poles. In these kinds of standard applications, with a well-calibrated instrument using surveyed ground control, LiDAR can achieve sub-centimeter accuracy. For the Sanilac Petroglyphs project, crews could get very close to the subject. Using about a dozen tripod setups, they were able to collect nearly 3 billion information points and map the site to accuracies in the millimeter range - revealing details that would not be apparent to the unaided human eye. In addition to using LiDAR, specialists also made a close-up photogrammetric survey of the petroglyphs using 155 overlapping photos. Software can use these images to create a second type of 3-D model of the petroglyphs. The new digital models could have several important uses. Foremost is preservation. The current models can be compared with older drawings and castings of the petroglyphs going back to the 1920s to reveal changes in the fragile sandstone surfaces over time. "Part of the reason for collecting this data at this time is to create a digital representation of the carvings in case of further degradation by natural or manmade forces," said Frank Boston of MDOT's Survey Support Unit. "This representation will be available for future generations regardless of the condition of the actual site. We plan to do a similar data collection in five years so the data can be compared and measured." The LiDAR data set is also being used to create a digital 3-D mesh of the carvings that can then be transformed via software into a realistic rendering. The digital model can be used for tribal-led distance learning projects. The collaboration on the LiDAR survey started back in 2017 when Tchorzynski began researching LiDAR specialists in Michigan, specifically looking for potential state partners with the capability. She contacted MDOT about their equipment and asked if they would be willing to cooperate on the project. "We had verbal approval from management quickly," Boston said. "We all felt that it would be a great partnership, providing valuable products and data, and providing MDOT with experience and exposure for this wonderfully useful technology." Images and information from the petroglyph preservation project were featured on the 2018 Michigan Archaeology poster. The free poster is available from the SHPO upon request. Donated to the State of Michigan by the Michigan Archaeological Society and managed by the DNR since 1971, the petroglyphs are listed in the National Register of Historic Places. Sanilac Petroglyphs Historic State Park covers 240 acres along the Cass River near Cass City. Guided tours are available in the summer months. To learn more about the park, go to https://bit.ly/2OSXmte. To see the 2018 Michigan Archaeology poster featuring the petroglyphs and the LiDAR survey, visit www.mi.gov/archaeology.